SOUTHFIELD, Mich. -- Buckfire & Buckfire, P.C. 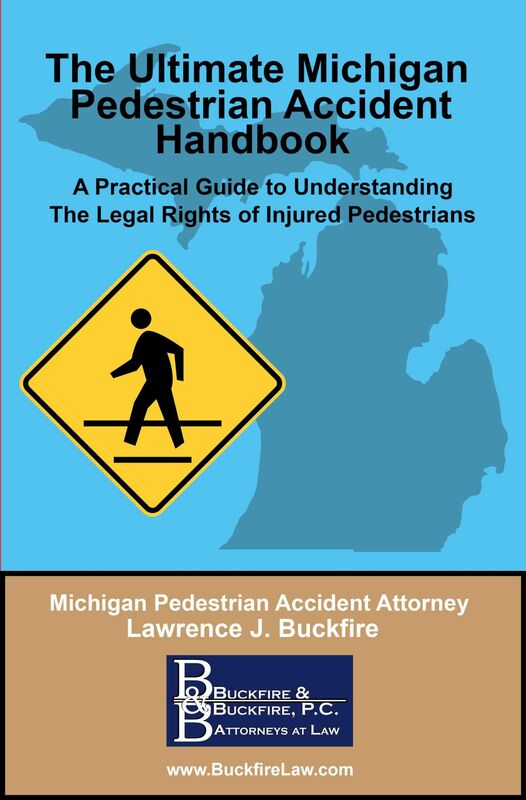 is pleased to announce the distribution of the educational guide, "The Ultimate Michigan Pedestrian Accident Handbook." The guide will be distributed worldwide through www.BuckfireLaw.com. Widely viewed as one of the top-rated personal injury lawyers in Michigan, Lawrence J. Buckfire helps explain the legal rights of a person injured in a pedestrian accident. The insurance laws in Michigan that apply to pedestrian accidents are complicated and change on almost a daily basis. This guide was written to explain the complex laws in simple terms, and offer helpful suggestions. "The insurance laws in Michigan regarding pedestrian accidents are very confusing," Buckfire said. "The No-Fault law was created in 1973 and there have been over 2,000 written court opinions regarding these laws. This guide helps make these laws easy to understand for someone who is not a lawyer or judge." Buckfire's 26-page guide details secret deadlines that will destroy a case if there's a delay in hiring a lawyer. It also reveals how to find the best Michigan pedestrian accident lawyer for your case, and the key questions that must be asked before hiring a lawyer. Buckfire, the lead trial attorney and managing partner at Buckfire & Buckfire, P.C., will help you eliminate hours of stress, confusion, and uncertainty in this must-read, educational handguide. Lawrence J. Buckfire earned his undergraduate degree in economics from the University of Michigan in 1986 and his juris doctor degree from Wayne State University School of Law in 1989. He is admitted to practice law in the State of Michigan and the State of Ohio. He has been named a SuperLawyer, Best Detroit Personal Injury Lawyer, and Top 100 Trial Lawyers in America. Lawrence has obtained significant jury verdicts and settlements for his injured clients. Mr. Buckfire has achieved the highest possible rating for ability and integrity in the legal profession. He specializes in medical malpractice, nursing home neglect, child lead poisoning, wrongful death, and automobile negligence. Mr. Buckfire is a member of the American Lawyer Academy, Michigan Association for Justice and the American Association for Justice. He serves as a mediator for the Wayne County Mediation Tribunal and is a member of the Michigan Brain Injury Association. Buckfire & Buckfire, P.C. has been Michigan's most trusted personal injury law firm for over 50 years. Widely viewed as Michigan's most trusted personal injury law firm, Buckfire & Buckfire has a tremendous track record of successful settlements and jury verdicts. For a free, no-obligation evaluation of your case, call Buckfire & Buckfire at (800) 606-1717. Should you require additional details or wish to reach the author, please contact: [email protected] or tel. (800) 606-1717.